A couple of years ago, I thought I had a stroke of brilliance when I decided to stuff some dates with blue cheese, wrap them with bacon, and broil them. 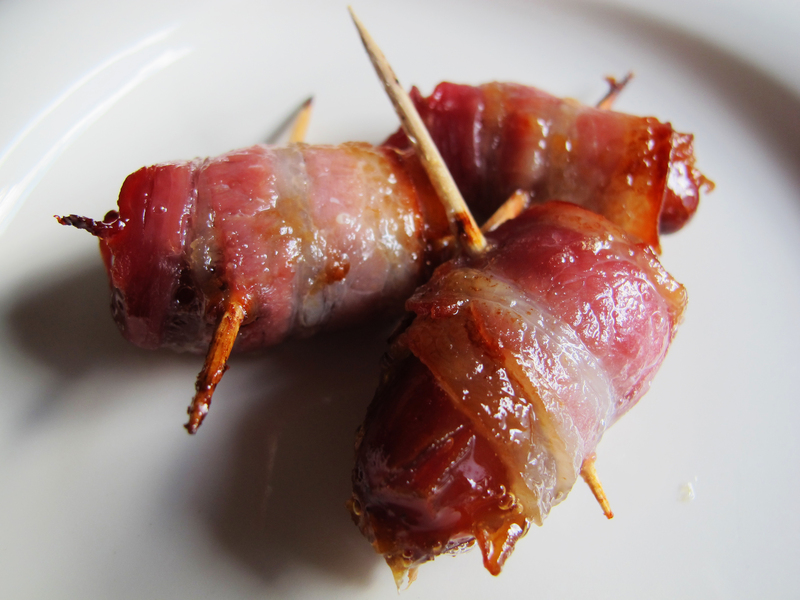 Bacon-wrapped dates…good, but nothing new. Stuffed with blue cheese on the other hand, particularly good. So I rushed to the computer to look it up and found that it had already been posted. Disappointed, I decided not to post it here. But it’s not like I posted the first Swedish meatballs recipe, or the first recipe for ostkaka. So…here are bacon-wrapped dates stuffed with blue cheese. Dates are a bit too sweet for me to eat on their own. Back when I was studying Svenska för Invandrare (Swedish for immigrants, the state-run, free course, to teach immigrants Swedish), I had a classmate from Iraq who gave me some really lovely dates as a gift. I hated to see them go to waste, and vaguely remembered that my mother used to broil bacon-wrapped dates for cocktail parties back in the 70s. Bacon is meat candy and makes everything better, so bacon-wrapped dates became my goal for the gift. As I was pitting the dates, they were begging to be stuffed, and I happened to have some blue cheese on hand. Voilà! A super-tasty appetizer. It takes a bit of time to pit, stuff, and wrap the dates, perhaps a minute for each one, but the end result is something that can be prepared in advance, broiled prior to serving, and even tastes good at room temperature although I prefer them a bit warm. You can use regular blue cheese, or get fancy with Roquefort but I found the latter to be a bit too overpowering in terms of smelling up the house (but then again I was making 70 of these darlings lately for a family gathering). You can also mix it up with goat cheese, cream cheese, or tuck some almond slivers in there. You don’t need loads of cheese. I used 5 ounces (125g) to stuff nearly 70 average-sized dates. And half a slice of bacon will probably do nicely for each one. Savory and sweet with a hint of richness from the cheese, they may not be the most beautiful appetizer on the buffet table, but they will probably be one of the favorites. Soak the toothpicks in water for at least 7 minutes before broiling so they won’t burn in the oven. Preheat the oven to 400°F(200°C). Carefully cut a slice into the side of each date and remove the pit. Use a small knife tip to stuff enough blue cheese into the date to fill up the cavity. Wrap each date in half of a slice of bacon and secure with a toothpick (if you are preparing the dates far in advance of broiling, wait to put the toothpicks in until you are ready to broil them so they don’t dry out and burn). Place the bacon-wrapped dates in a shallow baking dish or on a foil-lined, rimmed baking sheet. Bake in the center of the oven for 5 minutes, turn, and bake 5 minutes longer or until the bacon is crisp and browned. Serve immediately ,warm, or at room temperature. Yum! I make them with goat cheese instead of blue cheese, skip the toothpicks, and buy the bagged ICA brand dates that are already pitted — making it really fast to make. Will have to try blue cheese (but then only I will eat them) (oh, wait, that’s a fantastic idea — more for me!). The toothpicks are only really necessary if you are serving them at a party. Then they make it easy to pick them up. I’ll have to scope out the pitted dates at ICA. Sounds lovely! Do you think it would taste the same with figs? I don’t remember Mom ever wrapping dates with bacon. I do distinctly remember her wrappying water chestnuts with the bacon in brown sugar though. This sounds really good. I had a really tasty fresh fig stuffed with blue cheese and if I recall correctly, wrapped with a bit of prosciutto… it was divine!!! Hi there! Interesting with the walnut-stuffed dates. I read some recipes online where people sprinkled the bacon-wrapped-blue-cheese-stuffed dates with brown sugar before broiling. I haven’t tried that version, but I’ll have to. My parents used to make “candied bacon” where you sprinkle bacon strips with brown sugar and broil it. YUM! Actually, when I was reading your recipe, I was thinking ‘hmmm… and maybe sweeten up the bacon with honey” though that might not be practical for broiling. Again, tho, you’d think that the date is sweet enough and why add more sweetness but somehow it calms down the bacon (especially if its a fatty bacon). I LOVE the brown sugar on bacon idea… I’ve not ever done that!